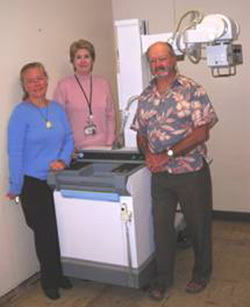 The Kohala Hospital Charitable Foundation has purchased a new state-of-the-art Radiology equipment called GE AMX4+ through a grant provided by the HMSA Foundation. The portable X-Ray machine is compact, maneuverable, and provides the same type of image quality as stationary systems. “This is one more tool to use for diagnosing and treating our patients, especially those who cannot be moved from the Emergency Department into the Radiology room for their test. Now the equipment can come to them,” said Pat Kalua, Administrator of Kohala Hospital. The unit can perform exams without being plugged into an electrical outlet. It also features a variable speed motor that provides maneuverability, a lightweight hand switch for comfortable alignment verification and exposure control, easy and intuitive positioning through 270-degree column rotation, and produces high image quality. Other attributes include its wide range which facilitates even difficult lateral-hip and spine studies, the digital microprocessor control that delivers extremely accurate and consistent technique output from exposure to exposure regardless of battery charge, and it provides accuracy and reproducibility that translates into excellent results the first time. Furthermore, it is virtually maintenance-free with a rechargeable lead/acid battery that produces up to 50 exposures on a single charge and has diagnostic software that automatically initiates self-check at startup and streamlines troubleshooting should a problem arise. It also has a tube arm latch that relieves column stress during transport, even over elevator thresholds and hall expansion joints. All of the benefits of this “top of the line” model will provide better and faster health care services to patients at Kohala Hospital. With the growing population and higher demand on health care services, this machine will be a great benefit to the community. Kohala Hospital Charitable Foundation (KHCF) was incorporated in Hawaii in June 2002. KHCF was founded to perpetuate the preservation of Kohala Hospital and its services to the North Kohala communities. It was organized exclusively for charitable, scientific and educational purposes, and limits its activities to those that benefit and or relate to the hospital. It seeks financial avenues for purchasing equipment, constructing or renovating facilities, assisting in educational and outreach programs, and aiding any other program or activity that supports the hospital.